Topclimber: Mast climber equipment for any mast length! Topclimber®: Mast climber equipment for any mast length! TOPCLIMBER® is the only solo mast climber that allows the operator to work ABOVE the masthead without leaving the chair, and to go to any place above the deck. With this mast climber from Topclimber the operator can climb the mast safely and quick using the leg muscles without any assistance from others. Made in The Netherlands by TOPCLIMBER® International. Since 1994, no later mast climber system competes! Patent pending. No other solution does that! Order now! Feels good and safe: providing years of easy use. Convenient: Climb quick using your leg muscles. Fast: Climb 50-70 cm per jammer movement. Easy to use: do everything yourself. Strong: Tested up to 600 kg. Smart: A clever product for sailors. One price: Topclimber is for any mast length – at the same price. It’s really satisfying to know I can check out the mast head parts, sheaves and fasteners etc. Several times I’ve climbed the top of the mast just to enjoy the sunset view and the cool breeze. In the past the above deck area of my boat was the only part to which I didn’t have access. Now I can reach everything, and safely. A big benefit is that the harness is quite comfortable, no more problems with the straps cutting off circulation in the legs. 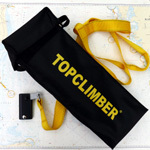 Order the one and only Topclimber® direct online from Topclimber International. 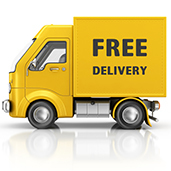 Our webshop allows for PayPal and credit card payments for a secure and easy way to pay for your order. Ordering the Topclimber includes FREE WORLDWIDE DELIVERY.